What is Envision Festival About? One of the biggest transitional festivals in Central America, Envision Festival is a 4-day musical, cultural and artistic adventure. It is by far one of the most popular festivals in Costa Rica. Envision is more than just a music festival, it is famous for being a life-changing experience. 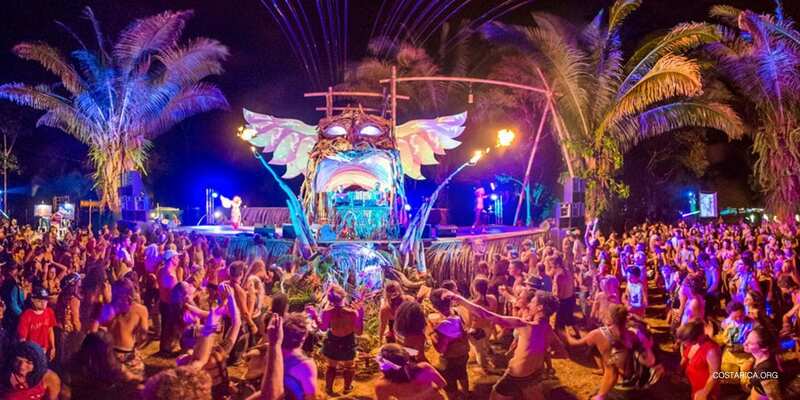 On the beautiful Pacific coast of Uvita, Envision Festival takes place between the jungle and the ocean. The goal of the festival is to bring people from all cultures and backgrounds together in music, art, yoga, spirituality, performance, dance and education. In fact, the 8 pillars of Envision Festiva are movement, spirituality, music, radical acceptance, community, permaculture, health and art. Let’s plan your Envision Festival Experience together! Let us help you organize your trip to this once in a lifetime experience! We’re local experts that can help take the stress out of planning a trip abroad so that you can get the most out of your time here in Costa Rica! Check out Costa Rica Vacation Packages to see all the adventures and activities you can take advantage of here in Costa Rica. Here are some essential tips and things to bring for your Envision Experience! Envision is a celebration of different cultures and it pushes the potential for humans to learn from each other in a sustainable community. Envision Festival is extremely environmentally motivated, there’s even been some reforesting done in the past six years! So plastic and single-use utensils are forbidden, however, all food sold at the event is completely organic and grown by local farmers! There is also a grocery store in Uvita which carries most basic products–remember to bring your own utensil! As tempted as you might be to just explore the fantastic beach and jungle right away, an important piece of equipment for your travel is right below you! Footwear that you chose to bring can define your whole Envision Festival experience. Don’t forget to pack strong, good quality footwear so you can go out explore the whole festival without worrying. Remember that temperatures in Uvita rarely vary, excluding some hot summer weeks, Uvita is mostly known for its temperate and pleasant weather! However we always recommend bringing sunscreen on your travels to Uvita. The hottest months are April, May, and June. It can get to 84.2°F! (29°C) Don’t let a nasty sunburn ruin your experience! First-timers coming to Envision Festival can get valuable information from past attendees! you can find information about Envision Festival on the Envision Festival Facebook Group. Previous Envision Festival attendees can ease your first-timer worries with the right recommendations and guides. Contacting them through the Festivals Facebook Group is very easy and most people will be delighted to assist you with any questions you might have. The Village acts as a central hub for all attendees. It’s filled with food stalls, amazing markets, workshops, and a ton of events! The year-round tropical climate provides Costa Rica constant access to a delicious selection of exotic Costa Rica fruits and vegetables that you can buy from local vendors! The beach is one of the more stunning aspects of Envision Festival, travelers huddle up there in the evening to watch the absolutely amazing sunset over the ocean. Swimming, yoga and even fire spinning are just a few activities that happen on the beach. However, the path to the beach closes around 5:30 PM so plan your itinerary accordingly! Envision Festival doesn’t come without a few health benefits. The natural beauty and laid-back atmosphere of Costa Rica make it the ideal spot for yoga and wellness. Yoga by the sea has lots of physical and spiritual benefits, This will help you forget the world you left behind. You can enjoy many different thought-provoking and mind-opening classes from some of the most inspiring yoga instructors in the entire world. Looking for more Information about Envision Festival? you can check out their official webpage to learn more about the Envision Experience. If you need help planning your trip around the Envision Festival you contact us for a custom itinerary! The 8th annual installation of Envision Festival was one of the best yet with great artist like fan favorite Xavier Rudd and Bob Moses 5,000 travelers came from all over the world to listen to more than 100 musicians converging at the festival, more than ever Envision Festival celebrated local choice flavors in a one of a kind experience!